Humans and other primates are outliers among mammals for having nails instead of claws. But how, when and why we transitioned from claws to nails has been an evolutionary head-scratcher. Now, new fossil evidence shows that ancient primates – including one of the oldest known, Teilhardina brandti – had specialized grooming claws as well as nails. The findings overturn the prevailing assumption that the earliest primates had nails on all their digits and suggest the transition from claws to nails was more complex than previously thought. “We had just assumed nails all evolved once from a common ancestor, and in fact, it’s much more complicated than that,” said Jonathan Bloch, study co-author and Florida Museum of Natural History curator of vertebrate paleontology at the University of Florida. The findings are scheduled to be published today in the Journal of Human Evolution. Grooming in mammals is not just about looking good. Thick body hair is a haven for ticks, lice and other parasites – possible health threats, as well as nuisances. Having a specialized claw for removing pests would be an evolutionary advantage, said Doug Boyer, an associate professor in the department of evolutionary anthropology at Duke University and the study’s lead author. It’s one that has been retained in many primates. 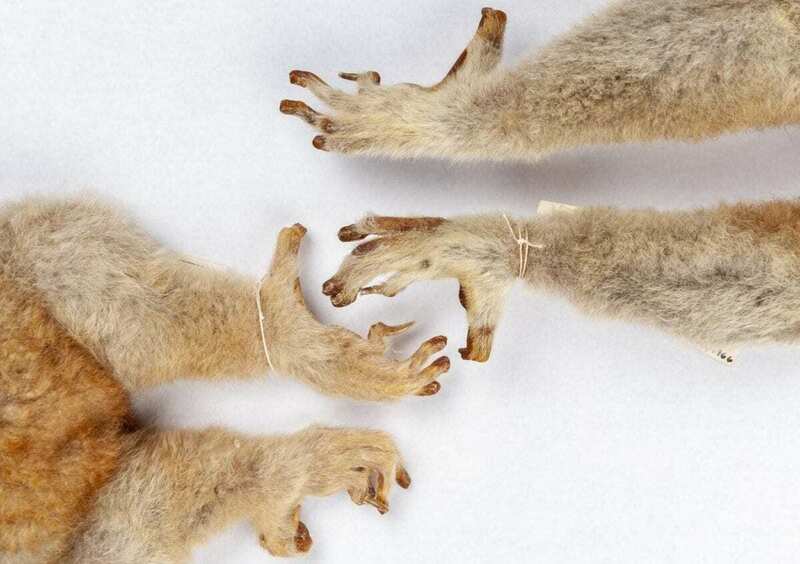 Lemurs, lorises, galagoes and tarsiers have nails on most of their digits and grooming claws on their second – and in tarsiers, second and third – toes. So, why did the ancestors of monkeys, apes and humans lose their grooming claws? One possible answer: because we have each other. This could explain why more solitary monkey species, such as titi and owl monkeys, have re-evolved a grooming claw, he said. Researchers had thought grooming claws likely developed independently several times along the lines that gave rise to living primates. But these fossils suggest grooming claws were hallmark features of the earliest primates, dating back at least 56 million years. They also come from five different genera of ancient primates that belonged to the omomyoids, the ancestors of monkeys, apes, humans and tarsiers – not the branch of primates that gave rise to lemurs, lorises and galagoes. In 2013, Boyer was at the University of California Museum of Paleontology, sifting through sediment collected in Wyoming several decades earlier, when he found several curious primate fossils. They were distal phalanges, the bones at the tips of fingers and toes, from omomyoids. The shape of these bones reveals whether they support a claw or nail. Bones topped with a claw mimic its narrow, tapered structure while bones undergirding a nail are flat and wide. The distal phalanges that Boyer discovered looked like they belonged to animals with grooming claws. Meanwhile, Bloch, picking through collections recently recovered from Bighorn Basin, Wyoming, came across what looked like a “strange, narrow nail” bone. But when he compared it to modern primates, “it looked just like a tarsier grooming claw.” Smaller than a grain of rice, it matched the proportions of Teilhardina brandti, a mouse-sized, tree-dwelling primate. Bloch and Boyer had co-authored a 2011 study describing the first fossil evidence of nails in Teilhardina. At the time, they believed the primate had nails on all its digits. Now, fossils were making them reevaluate their assumptions, not only about Teilhardina, but other omomyoids. On the off-chance that they could add one more ancient primate to the growing list of claw-bearers, the pair drove out to Omomys Quarry, Wyoming, once inhabited by another genus of omomyoid, Omomys. “We spent a day combing that site, never expecting to find something as tiny and delicate as a grooming claw,” Boyer said. The team picked one right off the surface. They had found grooming claws at three independent sites from omomyoids spanning about 10 million years in the fossil record. “That was the last nail in the coffin,” Boyer said. Why did primates develop nails at all? The question is a contentious one, but Bloch and Boyer think the transition away from claws could have mirrored changes in primate movement. As we ramped up climbing, leaping and grasping, nails might have proven more practical than claws, which could snag or get in the way. Grooming claws might seem insignificant, but they can provide crucial insights into ancient primates, many of which are known only from fossil teeth, Bloch said. These tiny claws offer clues about how our earliest ancestors moved through their environment, whether they were social or solitary and what their daily behavior was like.